A prolific artist, Jennifer Kemarre Martiniello reinvents utilitarian objects into things of beauty. After graduating in 1985 from the Australian National University’s School of Art with a major in sculpture, Jennifer has built an impressive body of work which celebrates her Aboriginal heritage and pays tribute to the oldest weaving practices in the world. A pioneer using the contemporary medium of glass as a vehicle for Indigenous cultural expression, Jennifer is also determined to support other Aboriginal artists. As a cofounder of Indigenous Textiles and Glass Artists, Jennifer supports other artists and has facilitated more than 80 exhibitions. Jennifer also established Kemarre Arts, the ACT’s first independent Aboriginal-run social enterprise focused on the professional development and promotion of artists. 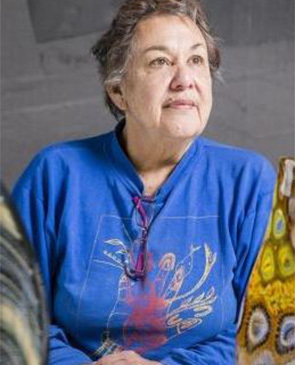 Jennifer and her colleague Lyndy Delian also established the Honouring Cultures program, which partners with the Canberra Glassworks to provide Indigenous skills development and international cultural exchanges. Jennifer’s work is helping Indigenous artists expand their practice and find new avenues to celebrate their rich history.